I really want to give someone at Mileage Plus a big hug right about now. This is probably the best week for Mileage Plus, well, ever. Check out the 2010 Elite Choice rewards. This is easily the best I’ve seen. Simply awesome. While there aren’t the “rewards” for thresholds below one’s status level anymore, the rewards above status levels are phenomenal. 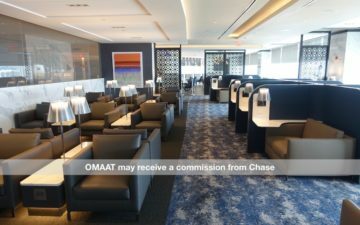 As a 1K, for example, I could get 25,000 redeemable miles for passing 125,000 elite qualifying miles and another 25,000 redeemable miles for passing 175,000 elite qualifying miles. That’s quite an incentive! Other options include nominating someone to Premier or Premier Executive (yes, you heard me right) status. The benefits get even better for those at lower status levels. I’m really surprised to see the nomination to Premier/Premier Exec. I’m a 1K, but I view the nomination to the Premier/Premier Exec as a devaluation of those status levels. With upgrades based on status levels and now the opportunity to get status based on who you know, anything below 1K is worthless. Just think, someone that flew 80k miles is the same as someone who is on their first flight but was given Premier Exec. Sad…….. Devaluation? You’ve got to be kidding me… think of how few 2Ps and 1Ps will be minted by this promotion… and if they don’t fly enough to make 2P on their own, then they likely won’t be on many of your flights! I don’t view it as such a big devaluation. I mean, we’re talking about 12 nominations to 1P and 50 nominations to 1K. That’s a drop in a pretty big bucket. Also, anyone get the feeling FT’er ua1flyer will win the 1P nomination every month? He’s already well over 1 million (!) EQM for the year, and counting. Profile says he’s an EIGHT (!) million (!!) miler. What’s the gift for that, honorary board member for life? Just saw what you were talking about with the 2P/1P nominations. Thought you were talking about the most EQM in a month or first 50 to 250k EQM promos. Still, agree with bmvaughn. I’d be willing to bet a large number of those nominations go to family members or significant others who do not fly nearly as much as the nominating member, if the threads on FT are any indication. I gave my wife 3P so we could get the whole family into E+ on the 2-3 family trips we take a year. I’d bet many others are in the same boat. Ooh … I wonder how much a 1K nomination will go for on the Coupon Connection on FlyerTalk! @gobluetwo — are you deliberately calling out Lucky on his own blog? 🙂 I’m sure as heck not going to bet against him. He might not win every month, but I promise you he’ll have at least 1 monthly win next year! And actually, I’m not sure I see this as all that great, at least at first glance. It seems like they are aiming to reward the very FFers more and more, at the expense of those who might be cutting back. Face it, I’m sure there are a lot of 1K’s who aren’t going to requal next year, and this basically eliminates the incentive at 75k. Seems that if you know, for sure, that you’ll hit 75k, but not 100k, this might lead you to credit to CO. Of course, I’m sure UA hasn’t thought through the math on all this yet, and will be reevaluating in mid-year! lucky, i never understood why you would fly 300,000+ eqms on one airline, the elite choice awards stop at 175,000, the marginal benefit to an additional 125,000 eqms on UA are no where as good as they would have been on AA. One of the interesting things that DL does at 25K threshold levels is provide similar benefits. However, after 150K it’s an additional 25K RDM per 25K flown so it adds up… FAST. I’m sorry to see the carry-forward EQM option go. I always opted for that and it was nice to start the year off with a small balance. Easily the best Elite Choice ever? Well, considering that I (a non-MRing 1K) most likely won’t get anything this time, I have to disagree with it. I can’t see my self flying aimlessly around the country, motivated by these choices. I do realize that the elite choice program is (at least in recent years) meant as a motivator for people to fly more. And I am okay with that and I don’t complain about it. Not every promotion needs to be useful or valuable to me. But the way I see if for me and the other accounts I manage, fewer people will get something out of this promotion and thus it’s an “enhancement” …. I wonder whether there will be Double EQM for 6 months in 2010 like this year, it certainly makes getting to these targets easier. In my opinion these nominated 1P/2P don’t affect the real frequent fliers much, E+ may be slightly more crowded on some flights, but that’s about it. Meh. As a 1K who will likely only re-qualify for 1P at 75k next year, this is kind of weak. The 3P nomination at 75k was really nice. Once I hit 50k next year, I’m probably going to call it a day. At least for me, hitting 100k on personal travel is difficult. I do wish they would remove the restaurant.com options. Sorry Lucky, you know I agree with you a lot, but I’ll reiterate just how lame this year’s Elite Choice awards look. And it seems the thread on FT would agree with me, and almost everyone posting here. I have to agree with Hobo13, i really don’t see why this is so fantastic. assuming we’re not going to get the 125,000 EQM bonus that we got this year, this is actuarial quite a step down. there will no longer be a 3p nomination. I’m not a big fan either, I liked having the 3P nomination for co-workers and family, but it makes sense from UA’s perspective and goal: which is to make people fly more than the previous year, so it makes sense that there is no 75K tier for 1Ks. I wish the value of RDMs was higher, like removing Starnet blocking or something. But if you fly 175K miles, you can earn 400K RDMs, which is not bad. -Respect, if things don’t go well. So while the once a year flyer won’t hurt some of you, think of all the benny’s (haha) they’ll get. I’m not asking. I’m just saying. This is not helping United strategically; take advantage of this while you can, because it won’t last forever. This creates incentives for the mileage runner, not the business traveller who may fly enough for the lowest rung of status, and is looking at programs to decide with whom to fly (and, I might add, whose revenue per seat mile is higher than for those like Lucky). It’s a bubble, these mileage programs. 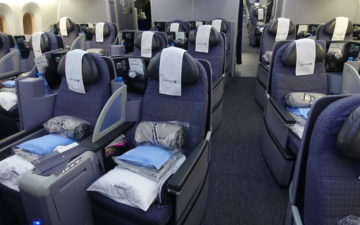 The argument I keep hearing is that the airlines must take care of their frequent fliers; with so much mileage inflation, and only mileage runners who spend as little as possible per seat mile flown, where do the high revenue generating passengers go? Another airline? 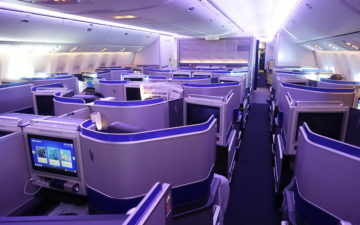 I would love to see the domestics sell their first class seats at a price point which will attract the business travelers willing to spend more money. Or for the leisure traveler who is willing to pop for something nicer (at a nice price) for a vacation. Frankly, the upgrade scam has got to change for the airlines to attract the high lifetime value customers. No offense to Lucky and the like, but the airlines need to put the kids to bed, and create an environment for the adults to enjoy. I think the airlines enjoy the publicity they get from frequent fliers blogging about all of this, but c’mon – is Lucky *really* the target market for the London City service on BA? Would Lucky *ever* pay full fare for that flight? Shouldn’t BA reward those fliers who spend full business fares? This is why I think revenue based systems are the fairest way to reward the best customers (e.g. those who spend the most). No use arguing this point, it’s been done to death. Flyertalkers remind me of the AARP – airlines don’t like to upset them (cause you guys are vocal) yet bowing to this pressure is strategically hurting the future of the airlines relationships with its best customers. FF programs as social security. The old people threaten to vote the politicians out of office (since they always vote), and the politicians take the short term benefit, and screw the next generation. All it takes is one airline to change, and the house of cards come down. @Eric – I think your points are valid, but also out of context. As an example, somebody could buy 1 ticket LAX-SYD in F for about $25,000 and be high revenue compared to Lucky – but that alone does not a profitable airline make! that kind of customer can potentially get rewarded with global services – which is revenue based. That is a good program, and rewards high revenue customers (who might only take 2 flights a year.) This cannot stand on its own though! That is why UA takes a two-pronged approach. People like Lucky fill the empty seats! And the airlines know that “bargain hunters” who fly alot might spread their travel over a zillion different carriers just to get the cheapest price thus making the mileage based FF programs totally worthwhile and necessary. The only thing that your points validate (in my opinion) is that a revenue based tier must be in place along side mileage-based FF programs – which is already happening. Also, UGS gives you a lot more than 1K does! Mileage Plus is one of the only parts of UA that is wildly successful and making a profit. 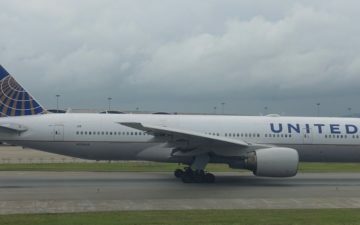 The market has spoken and UA is doing a good job with Mileage Plus. There’s always room for improvement though. What we all really want is a return of the elite team contest. I know my teammate Hobo13 would certainly agree…really encouraged us to crank up the BIS time.